Click to get full size. Thanks! This is my workspace. I cleaned it up today. I’m stoked and so ready for the marathon. Regarding ideas, I’m still a bit on the fence about it. One of the things that came to my mind which seemed reasonably interesting was to use music as an unconventional weapon. However in which way that should be implemented is still unclear. I guess, I’ll think about it more over lunch. My work stations. Will do my coding in Sublime Text on “Challenger” which is running Elementary OS Luna, a Debian/Ubuntu-based Linux distro with an attractive UI. Will use Endeavour if I need to use Photoshop or paint with my tablet. I’m very fond of my Unicomp keyboard. I might actually get another mechanical keyboard; an original “Model M”, in the mail today if I’m lucky. I’ve got my laptop, Acer iconia Tab A500 tablet, Nintendo DSi for when I need a break. Tux the penguin, Water bottle, notebook for concept art, Logitech headphones with mic, portable hard drive for backing up my work, a Tiny Game Design Tool booklet, and a few reference books if needed. I’m now officially ready for Ludum Dare #24! Finally done with finals and getting set up! I’ll be hacking up some quick basis code over the next couple hours (it’ll be on my github here). I’ll probably be using SDL this time (I usually do 3D stuff, but I’d like to give something 2D a try). I’m in, as a 2011 goal! 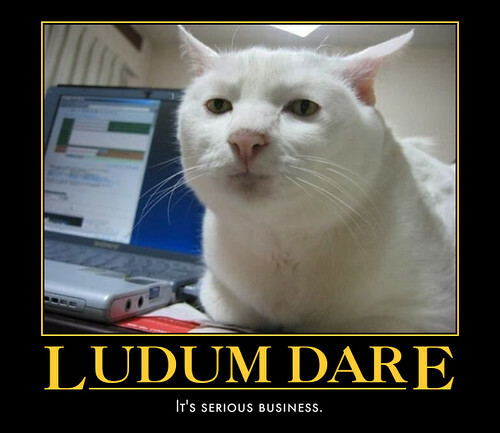 One of my 2011 goals is to participate at least once in Ludum Dare. I couldn’t make the other ones this year, so I’m not skipping this! I’m totally in! Unity 3D with C#. Also iTween and 2D Toolkit if going the 2D route.